I’m a bit of a bookworm at heart. I really like finding solace and comfort in a good novel and I try to learn as much as I can, especially when it relates to both work and running. After a disappointing race at Rock ‘n Roll Chicago, I felt compelled to pick up a book or two. I felt like I needed something to “get my head on straight” and shake me out of feeling like my goals were insurmountable. I know I’m not alone in thinking these kinds of negative thoughts, judging by the number of books related to mental training in sports (trust me, there are quite a few out there) available on Amazon. 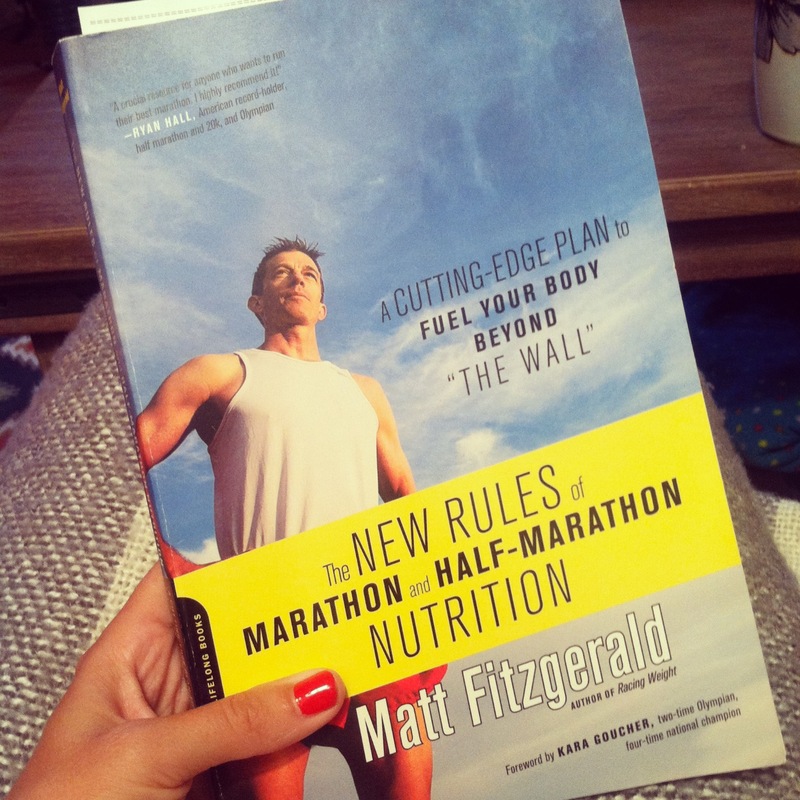 I’m also in the middle of reading Fitzgerald’s The New Rules of Marathon and Half Marathon Nutrition. I’ve never really felt like I’ve had a “problem” with my nutrition. (I mean, more than a few slices of pizza and a couple beers does the body good…right?!) I don’t seem to have fueling issues for my long runs or races but that doesn’t mean that I can’t learn something that will help me push harder and run faster. I had already picked up these two books before Rock ‘n Roll. The next two books on my list really focus on mental stamina. In the Runner’s Guide to the Meaning of Life, Burfoot writes: “While running…appears to depend on great physical strength & endurance, it is, in fact, based almost entirely on strength of the mind”. Coach recommended In Pursuit of Excellence by Terry Orlick. After posting my thoughts on RnR, a few of you recommended Run: The Mind-Body Method of Running by Feel by Matt Fitzgerald. If I don’t have enough inspiration after reading all of these books and watching that TED talk 10+ times, it’s likely my own fault. What resources have helped you either mentally or physically in your training? Are you as “bookish” as me? The last time you were in a “mental rut”, what did you do to get out of it? Thanks for this Jenny! I’m stocking up on books to read so this is perfect! I need some inspiration! No problem, Christine! Let me know which ones you pick up! Reading books definitely can be inspiring. 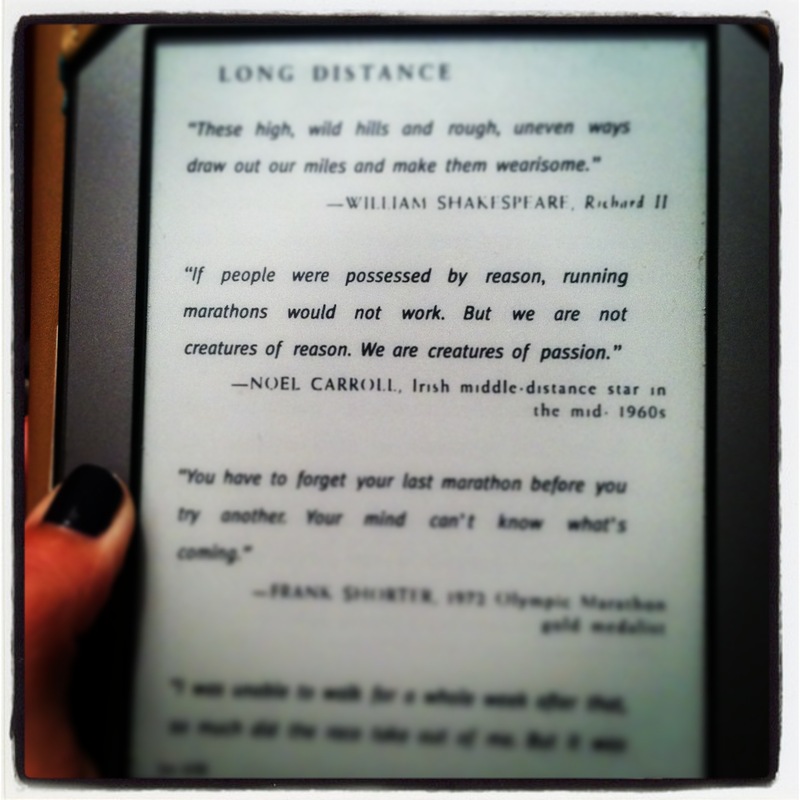 Makes me want to go out and try the things I read, or sign up for more races. It definitely helps, I am a nerd so it’s a good inspiration for me 🙂 I have a nice long list of books I want to read that I will add one to my kindle whenever I really need to just get lost in a book and come out with some new light. Sounds like we’re very similar 🙂 “Some new light” is just what I need. Definitely a bookworm, and share your tastes, esp. on Fitzgerald. I submit that his Mind-Body method title is one of the best books ever written on running, no kidding. I have the half marathon nutrition book, but started reading right before a half and realized there wasn’t time to implement much. Thanks also for the Noakes video, I finally watched it. Great stuff. I think I found you via Coach Hadley indirectly. His athletes really train hard and smart. My times are quite similar to yours (though I’ve not run a marathon), so I look forward to following your training! With a review like that, I’m sure I’ll enjoy the book! Next up on my list. I’m glad I bookmarked that Noakes video because I’ve watched it several times in the past year. When’s your next race? Well, I’ve just strained my hamstring… Not seriously. Had been toying with a 5k on August 4, just to maintain focus, but that’s off the books. I’d like to finally crack 1:30 in the half – in November. Maybe a 10k in Sept and October? Sorry to oversell the book! But it’s very, very good. So many running titles are a bunch of charts and explaining paces and distinguishing workouts — all valuable — but this book delves. Great to mull over, absorb, and read again. Wow, how refreshing that someone can’t recommend that book. There is some good stuff in it, of course, but how can people get around how bad the writing is? The narrator is so unlikeable. The book baffled me — it was hard for me to finish — but mostly did on the strength of its reputation and a fascination with how incredibly bad it was. Yes, I totally agree re: disliking the writing and the narrator! At least it wasn’t very long — that was the only way I could finish it. Oh, also because I had to return it to the library before the due date.